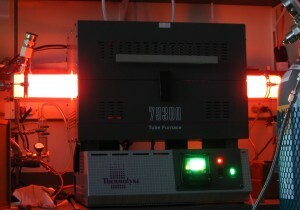 Yoe is a graduate student at the University of Wisconsin, Madison. He is interested in transforming the nature of matter. Yoe is also interested in things that are very small. 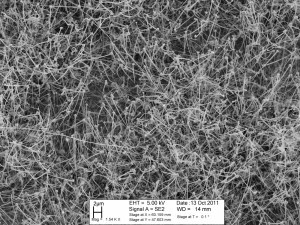 He combines these interests by researching nanowires made of the element silicon. Before we dive any deeper, let’s talk about what the heck “nano” means. 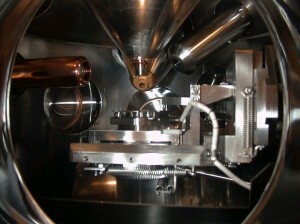 “Nano” usually refers to things that have one dimension (height, width, etc) of 1-100 nanometers. This is around 100 to 100,000 times smaller than the width of a human hair. SMALL! 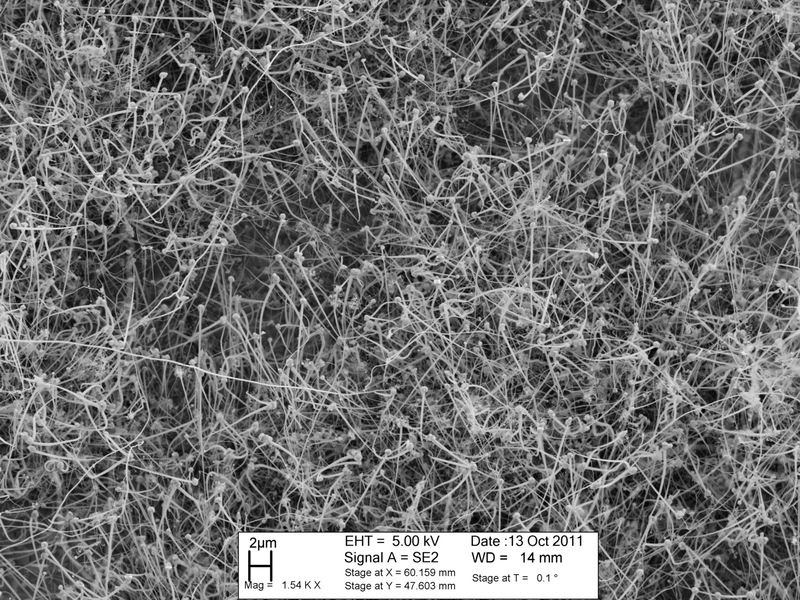 A nanowire is simply a wire whose diameter is around 100 nanometers or less. 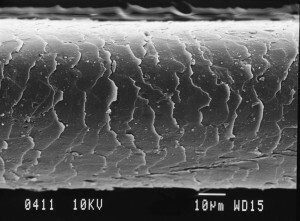 A human hair could be called a “microwire,” since its average diameter is around 100 micrometers. It’s not completely clear what happens next, but here is a guess. These insanely hot conditions cause some of the solid silicon oxide molecules to jump from the bottom of the tube, into the hydrogen gas stream. 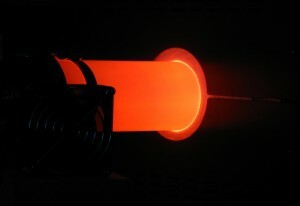 During their journey down the tube the silicon oxide and hydrogen can react with one another and be transformed into the pure element silicon. Towards the edge of the furnace the temperature in the tube drops, and this causes the newly formed silicon to fall onto tiny stainless steel disks that Yoe placed there. In his first experiment he put a bunch of disks in the tube, because the disks towards the outer edge of the tube would be cooler and the disks towards the inside of the tube would be hotter. Yoe wanted to find the “sweet spot” where the temperature was just right to allow his nanowires to form. Yoe thinks the nanobrain started out as a nanodroplet of liquid silicon. 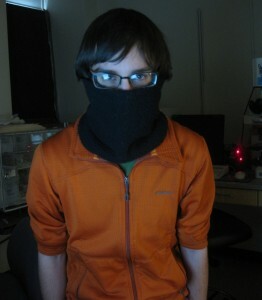 He thinks that as the silicon cooled down, the outside surface solidified first. Then as the inside of the nanodroplet cooled and shrunk further, the solid silicon shell crinkled up–kind of like how the surface of a grape shrivels up when it is dried out to become a raisin. This is also similar to how your fingers prune up when they’re in water, though the mechanism for that is a bit different. Here’s what is kind of surprising. 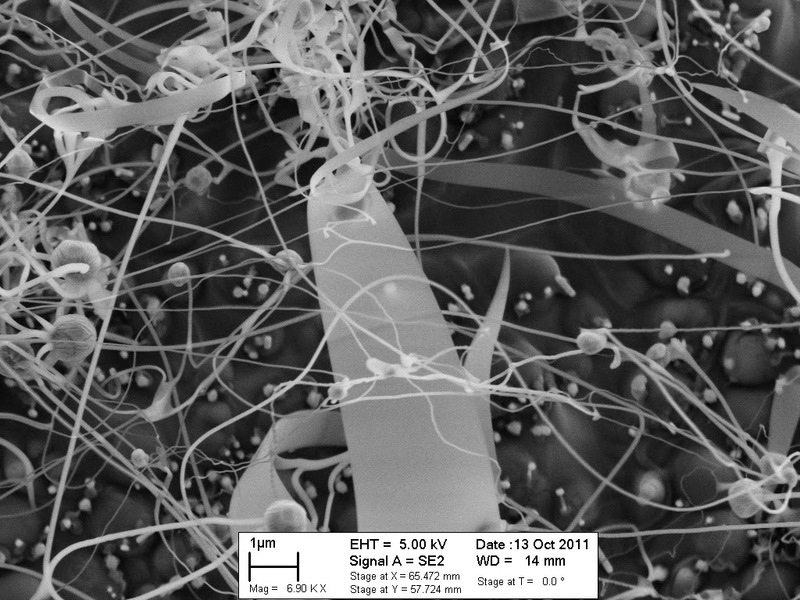 Yoe thinks the nanobrain and the insane jumble of wires and ribbons are really cool, but he is more interested in doing experiments using the nanowires shown in the first image. You may ask, “Is Yoe some sort of dummy? Why isn’t he more interested in the awesomer-looking image and the nanoBRAIN??! ?” Yoe is no dummy. 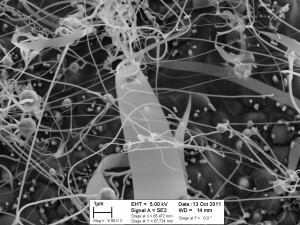 He is making these nanowires to study how they will work in the batteries of the future, and he prefers the nanowires in the first image for two main reasons. #1) There are a lot of them. Their abundance, in addition to their tiny size, will make for a more powerful battery. #2) They are all pretty much the same size and shape, which makes them easier to study. If he saw something awesome happen using the insanity in the second image, it would be difficult to determine whether it was caused by the nano-sized wires, ribbons, spheres, or corkscrews. Scientists love cool-looking stuff, but they also want to know answers–and these interests don’t always overlap. This post originally appeared on the blog Science Minus Details. Thanks! 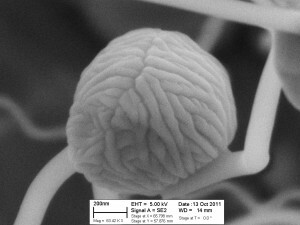 Can’t take any credit for the wicked SEM images. Yoe is a wizard on that thing! I think it would be easier to write a book on the current state of chemistry than it would be for nanotechnology.